In the 1995 Mel Gibson smash hit movie Braveheart, the Scotsman William Wallace is about to leave his kilted army and join uninvited the pre-battle talks between the British and Scottish leaders. Wallace's friend Hamish asks, "Where are you going?" Wallace with a puckish glint to his eye replies, "I'm going to pick a fight." Hamish unphased nonchalantly remarks, "Well, we didn't get dressed up for nothing." Two days after the dust settled and the Middle East yet again seemed to pull back from the brink of disaster, what actually occurred could be discerned from reports by the opposing armies, United Nations Interim Forces in Lebanon (UNIFIL) stationed to keep peace along the border since the Second Lebanon War in 2006, satellite footage, and even live video taken during the incident. Despite conflicting reports on who was on who's side, who shot first, and how many actually died, the actual chain of events now seems to have been somewhat agreed upon. Along Israel's northern border adjoining Lebanon is what's called the "Blue Line." It's a United Nation's recognized demarcation line between the two countries. Lebanon sits to the north and Israel to the south. Running the length of the Blue Line are fences, military outposts, soldiers, weapons, bordering roads and some of the most sophisticated electronic scanning and detection equipment known to exist. It's also where some of the greatest tension in the world exists. Like Braveheart's Longshank's and Wallace's armies standing opposite each other expecting the call to battle at any moment, the Israeli and Lebanese armies stand across the line from each other, supposedly kept from firing by the UN peacekeeping force UNIFIL. Live video footage taken by the troops there definitely place the first shot on Lebanon's side. While the Lebanese side claims it fired warning shots thinking Israel was over the Blue Line, the Israeli unit reported they first heard sniper fire, which seemed to be the case as the unit's senior officers went down first. 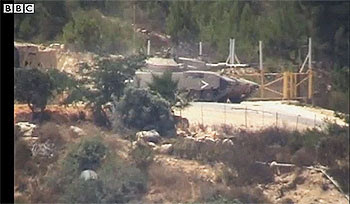 The IDF unit responded with rocket-propelled grenades and tank fire, and "several minutes later an Israel Air Force helicopter fired at the Lebanese army battalion command center, damaging several LAF armored combat vehicles," according to military sources in another IsraelNationalNews.com report. Lebanese soldiers then fired four rocket propelled grenades (RPGs) at an IDF tank, but missed. UNIFIL forces stood on the Lebanese side and watched on. In the end, those killed where two or three Lebanese soldiers, a Lebanese journalist, IDF Lt.-Col. (res.) Dov Harari who was battalion commander of the Israeli unit, and IDF Captain (res.) Ezra Lakia was badly hurt. Accusations of blame fly from the leadership of both sides of the line. Lebanon claims that the Israelis were operating in its territory, leading Lebanese Prime Minister Sa'ad Hariri to condemn what he calls "Israeli aggression." 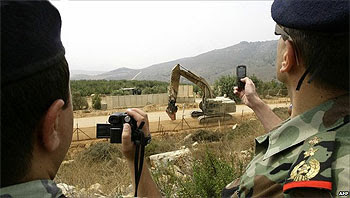 The Israeli Foreign Ministry is holding the Lebanese government responsible for what it calls a "grave incident" and its Minister Avigdor Lieberman is filing a protest with the UN Secretary General and the Security Council citing a severe violation of the UN Security Council Resolution 1701 which ended the Second Lebanon War. Other's see more sinister ties, claiming the two hour delay was to give time for the Lebanese to stage the skirmish. 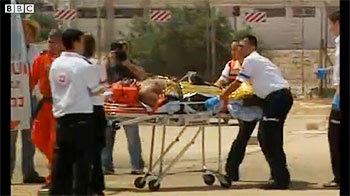 Reporting from Ashkelon, which had already seen a recent attack compounded with the shelling of the resort town of Eilat in the south, journalist David Dolan states "Interesting enough, the family name of the slain IDF reserve battalion commander, Lt Col Dov Harari, is almost identical to the Lebanese Prime Minister Saad Hariri. A UN report is expected to be released very soon, blaming a Hezbollah assassin for murdering Hariri's father in 2005 while he was also serving as prime minister. The report leaves the Iranian and Syrian backed militia with an urgent reason to start a conflict with Israel in order to divert attention away from its own crimes inside of Lebanon." The sniper that fired the first shot has been identified as a Shiite having some Hezbollah ties. On Wednesday night, August 4th, a three-way meeting of Israeli, Lebanese and UN generals was held at the UNIFIL headquarters in Naqura to access the situation. According to an Israel Today report, UNIFIL's Maj. Gen. Alberto Asarta Cuevas will be conducting an official inquiry into the clash. 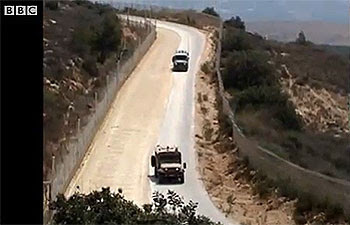 According to the BBC, Cuevas' initial statement, though, confirms that both the tree and the Israeli soldiers were on the Israeli side of the Blue Line when the Lebanese opened fire, substantiating the claim that the skirmish did in fact start from the Lebanese side. The world amazingly for once seems to agree that Israel wasn't responsible. The US State Department's response was to agree with the Israelis, with Spokesman P.J. Crowley calling the Lebanese attack "totally unjustified and unwarranted." The UN has quietly nodded towards Israel, and the news from the usually outspokenly critical of Israel agencies have buried the story, a clear sign they know the Israeli's were not to blame. Despite the world not openly against Israel on this issue, Israeli Prime Minister Benjamin Netanyahu was not fully pleased with the international reaction to the incident. He noted rightly that had Israel in fact been at fault there would have been harsh condemnations and calls for a damning international inquiry. Israel's call for justice has included that the Lebanese Army 9th Brigade commander who was ultimately responsible be dismissed or court-martialed. The problem remains, the Lebanese and Israelis remain dressed for a fight. There are too many loose cannon terrorists who are more than willing to fill William Wallace's role. When pruning a tree results in sniper and tank fire, we know that tensions wound so tight cannot remain wound for so long. Eventually, one side or another is going to start shooting, and cooler heads will no longer prevail. As Israel remains under constant rocket fire from its southern and northern neighbors, a time will come when the patience of the world's forth most powerful army won't endure, and Israel will be forced to remove the threat. Since the terrorist threat is now so interwoven into the fabric of the neighboring governments, Israel will have no choice but to conquer these governments and put them under military oversight. With their buffer territories gone, this will result in the wider circle of Islamic nations hostile towards Israel putting pressure on the newly expanded borders of Israel, and the heated border scenario will once more occur, leaving only a brief respite of peace and safety. For those who study what the Bible foretells concerning Israel's place in the Middle East crisis, they know indeed that this border tension will not last forever, and will finally erupt into said scenario. Israel will subjugate their hostile bordering neighbors according to Psalm 83, gain a small measure of peace, safety and wealth as Ezekiel 38:11 says they will have, and then Israel will be forced to face a larger ring of hostile countries that new found wealth provides them in the Gog-Magog Battle of Ezekiel 38-39. We are merely one tense misfire away from the domino effect that will eventually lead towards Armageddon and the all-out fulfillment of Bible prophecy concerning Jesus Christ's Second Coming. Sure, you can find a coincidental connection between some bad experience and something sinful--you always can. But I think we err greatly when we blame it on God. Billy, ask and ye shall receive - Floods and Fires Destroy the East. Just to clarify...I didn't me I'm NOT happy God deals with evil via the weather, I meant I'm not happy natural disasters also can hurt Christians or "innocent bystanders" if you will.